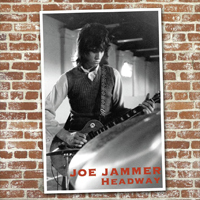 JOE JAMMER was given his name by Jimmy Page when he started working for Led Zeppelin in 1969 on the USA tour promoting their first album; first as a drum roadie, then as Jimmy Page’s guitar tech. So impressed was Zeppelin with Joe’s musical abilities that they recommended to their manager Peter Grant that he manage young Joe, and Peter promptly invited him to move from Chicago to London, where he recorded his first solo album “Bad News”, which was released on the infamous Regal Zonophone label in 1973. Joe then assembled a stellar cast of musicians to record his second solo album at Olympic Studios, Barnes in 1974 which included Mitch Mitchell (drummer for the Jimi Hendrix Experience), John Gustafson (bass player for The Big Three, Roxy Music), Johnny Contardo (vocalist for Sha Na Na) and recorded a stunning ground-breaking rock album. However, because of immigration snafus, Joe’s contract eventually expired with him stuck in Chicago without the third album ever being recorded, and the second album never being released-until now! 40 years later…Joe went on to find fame and fortune as a member of the Olympic Runners, then Nobody’s Business. Joe is presently living and gigging all over South London, and has recently been awarded the title “Most Sampled Guitarist Ever”. Angel Air gives you the whole story of Joe Jammer and the album in the informative booklet, but it's the high class music that's the main attraction here. From start to finish, this is superb funk/jazz/rock/pop music that should have been huge back in 1974. The story of Joe Jammer didn't end here though, as he went on to great success with Olympic Runners and Nobody's Business later in the '70s, and to this day continues to record & gig around London. This album will appeal to a wide range of music fans and it's certainly great that it's finally being made available for all to hear. Nice polished tracks include "Broken Little Pieces," "It Wasn't Meant To Be," and "The Watcher Laments." ...the songs are easily enjoyable, and if you are a classic rock aficionado you would not want to miss this! The Watcher Laments' pays homage to super-fly 70's funk rock, fragmented by exquisite rhythm arrangements yet executed in an effortless flowing manner. 'Not Tonight' can best be described as a sonic odyssey that owes more to psychedelic and folk-infused rock - it's dreamlike composition invites you to glide along imaginary clouds, only occasionally interrupted by thunder in the guise of Jammer's fine solo work. The unusually titled 'Axe Me Another (Don't Lose Your Head)' sounds as unusual as the song's title. It's free-floating and experimental jazz-funk rhythm may not turn this into a very danceable number, nonetheless there's enough going on here to lose yourself into! ...40 years on, Headway does indeed sound a fine album and a nostalgic throwback to a period in the mid 70s when honesty and purity of playing was the order of the day - and Joe Jammer as he still is today, was one of its most hard working practitioners. Angel Air gives you the whole story of Joe Jammer and the album in the informative booklet, but it's the high class music that's the main attraction here. From start to finish, this is superb funk/jazz/rock/pop music that should have been huge back in 1974. Headway contains a mixture of laid back trippy soft rock, R'n'B ballads and more acid rock tinged stormers. Jammer was given his name thanks to his love of jamming and these songs showcase his wonderful, effortless and laid back style.